The Center for Human Rights and Global Justice and the International Center for Transitional Justice are delighted to host on this milestone occasion the inaugural UN Special Rapporteur on matters relating to transitional justice, for a distinguished lecture and discussion. Doors open at 6:00 p.m. The lecture begins promptly at 6:30 p.m. and will be followed by a light reception. Watch the complete lecture below. 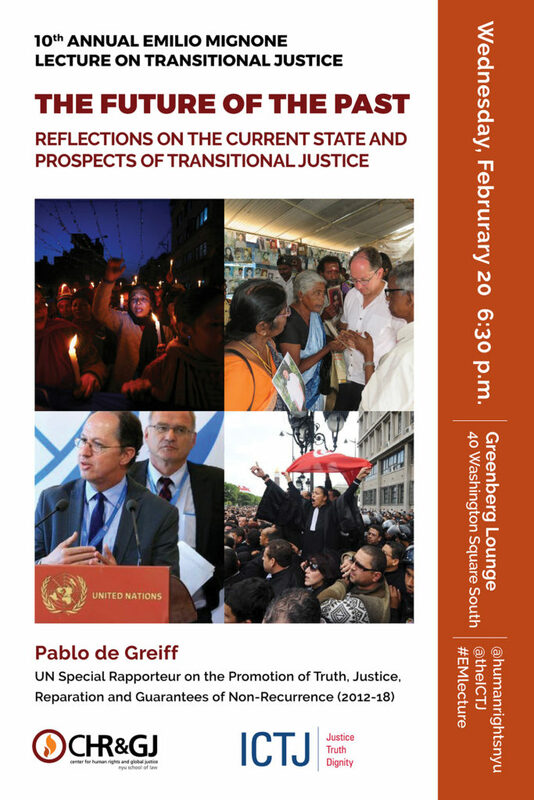 Pablo de Greiff directs the Transitional Justice Program at CHRGJ. He served as the first UN Special Rapporteur on the promotion of truth, justice, reparation, and guarantees of non-recurrence from May 2012 to May 2018. From 2001 to 2014, Pablo was the Director of Research at the International Center for Transitional Justice. Born in Colombia, Pablo holds a BA from Yale University and a PhD from Northwestern University. During his term as Special Rapporteur, Pablo conducted country visits to Uruguay, the United Kingdom and Northern Ireland, Tunisia, Spain, and Burundi, and delivered more than a dozen reports to the UN Human Rights Council and the UN General Assembly. Pablo has advised transitional justice bodies in Peru, Guatemala, Morocco, Colombia, and the Philippines. He is a vital resource to countless victims’ organizations and institutions focused on transitional justice, gender issues, and development. He also serves as an Advisory Board member of the International Center for Transitional Justice. This lecture series was named after human rights advocate Emilio Fermín Mignone, founder and director of the Centro de Estudios Legales y Sociales, and loving father of Monica Maria Candelaria Mignone, who was disappeared by the Argentine military on May 14, 1976. The series honors Mignone’s lifelong commitment to human rights, accountability, and justice and his vital leadership in documenting disappearances and other grave human rights violations committed by Argentina’s security forces. Past speakers have included Zeid Ra’ad al-Hussein, Sherrilyn Ifill, Darren Walker, José Zalaquett, Louise Arbour, and Aryeh Neier.